LA PAZ, Bolivia (CNN) -- A top Bolivian government official said Monday that the country's intelligence services had uncovered a plot to assassinate President Evo Morales. 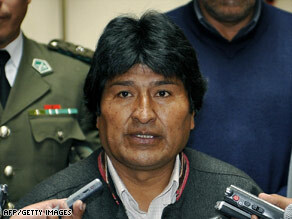 Bolivian President Evo Morales, during a press conference in October. "A few weeks ago, the state organizations of intelligence received information about plans in relation to an assassination, and that those plans came from the far-right opposition," Minister of Government Alfredo Rada told reporters in La Paz. Rada said the plan was to be carried out by an indigenous person while Morales was in a crowd. The assertion came after Venezuelan President Hugo Chavez said over the weekend that Morales, the nation's first indigenous president, had revealed to him in a telephone call the existence of the alleged conspiracy to kill him. Security around the president appeared tightened Saturday, when Morales visited the city of Cochabamba in central Bolivia, where he met with Paraguayan President Fernando Lugo. Some opposition legislators said that Chavez's declarations lacked credibility and said this was not the first time such an accusation has been made without accompanying evidence.